Over the last few months, life has been a bit crazy — in a good way. I happen to travel every single month or even a few times per month, so I barely had the time for makeup experiments. If you follow me for a while you know that colorful makeup is something that I looooovvveeee but I guess my traveling schedule influenced me to do the exact same natural look every single day when I’m on a trip. So today I decided to share with you some of the strategies that I use to get out of my travel makeup rut. I will also share a few tips on how to update your makeup game for spring if you feel like you are ready to try something new. Truth to be told, you don’t really need to shop for any new products if you feel uninspired. If you are anything like me, most likely you already have that shelf or two in your home full of beauty products that you never seem to enjoy. Guess what, we will start from revising and organizing it. If you are not familiar with the Marie Kondo method, you don’t need to deep dive into researching it first. Just watch an episode or two of her Netflix show to realize that the concept of cleaning is to get rid of all the things that you don’t like or use and keep only the items that you enjoy (aka those that “bring joy”). When it comes to beauty products, let’s start by dumping the content of the entire draw on the floor and start analyzing every item you have one-by-one. If you see anything that is expired or something that you haven’t touched in years, wash and recycle these tubes — or if it’s something like makeup you can’t open up to clean (cause that’s how you have to recycle beauty products) just throw it out. Then, go one by one through every product left and get rid of those that you don’t really enjoy. Feel free to swatch some of the pieces from your stash and even arrange all the “bringing joy” products in your drawer in a most efficient and eye-pleasing way. I love doing that sort of deep cleaning every month or so (when I’m not traveling, of course). During these sessions, I find so many products I seemed to forget about! And all the swatching while cleaning really helps you to find fun in playing with makeup! If you have a few palettes and blushes at your disposal, try organizing them in makeup bags by “capsule makeup sets” instead of having a dedicated drawer for just one group of products. For instance, put one palette you want to use more, one blush, one highlighter, one bronzer, one mascara, one lipstick, etc. in a dedicated makeup bag. Make sure all the colors match and work well together. Then, create another makeup bag with a second set of lipstick, eyeshadow palette, etc. and keep it separately. By establishing such capsule makeup sets you can just grab one of those bags every day so you get better use of the makeup products you have at your disposal. Not to mention that pre-thinking which colors will work better together actually will save you time when getting ready in the morning. Did you know that you can get a makeup consultation and try-on at almost every department or beauty store? And in most of the cases, you don’t even need to spend any money while doing so! My personal favorite is to go to Sephora or Ulta Beauty and talk to the staff members about some of their recent beauty favorites. Don’t be afraid to ask specific questions that you might have. Want to learn how to do a smokey eye? Need consultation on how to create a cat-eye eyeliner look? 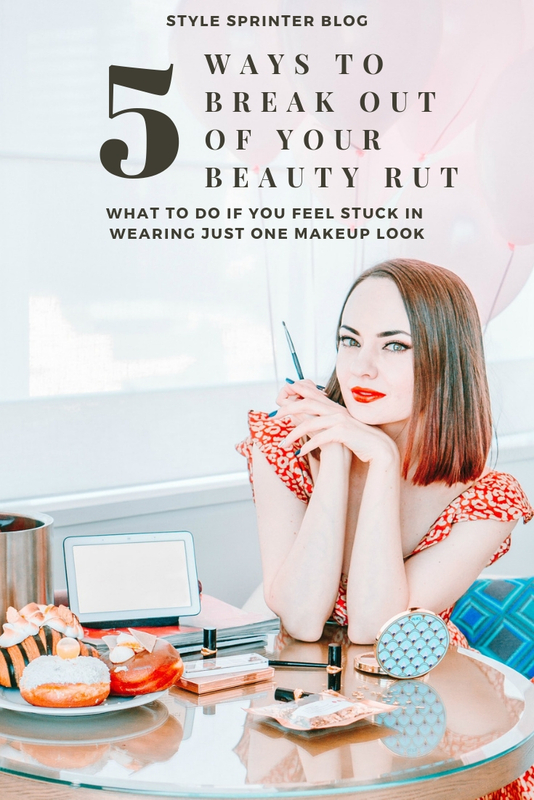 People working at MAC Cosmetics, Sephora, ULTA, Space NK, and other beauty stores are true makeup lovers and they would be delighted to help you out to get out of your makeup rut. Just be polite and nice about it and don’t come for a consultation during the rush hour — that way, they will have more time to spend answering your makeup questions. From all the methods mentioned in this post, this one is my absolute favorite! I love learning about all the trips and tricks people are using while applying makeup — because, hey, everyone has something new to bring to the game. I also feel that makeup tutorials are very uplifting because you can actually learn not only about makeup techniques but also about people who are sharing their makeup knowledge with you. If you don’t know where to start, try typing the name of the palette you want to use in the search bar and keep exploring. That’s how I personally find new creators to follow. And if I enjoyed their makeup tips and tutorials, I immediately sign up to get even more inspiration. I wonder if you are feeling the same way? What’s your current favorite YouTuber? Finally, if you really want to up your makeup game, consider signing up for a makeup master class. I recently had the opportunity to attend Mario Dedivanovic class that he did in collaboration with Laura Mercier and I can’t even describe how inspiring it was! I learned so many new techniques, had a chance to chat with fellow makeup lovers and came back home inspired to try all the new things I learned on my own face. Of course, makeup master classes could be very expensive but if it’s something you really want to learn about, I feel that these are truly worth your time and money. But if you are on a budget you can attend a master class too! Sephora offers a lot of free makeup master classes that anyone can attend — just make sure to sign up fast as a lot of people are fighting for the spots in these awesome free classes! I hope these tips were helpful with handling your makeup fatigue, so you feel inspired to experiment with your beauty stash more. Personally, I’m currently looking to schedule a few makeup master classes myself, so I feel even more inspired to create new makeup looks for you guys. I wonder if you’d like a step-by-step tutorial here on the blog? I might have a few fresh looks ready for the upcoming warm season!